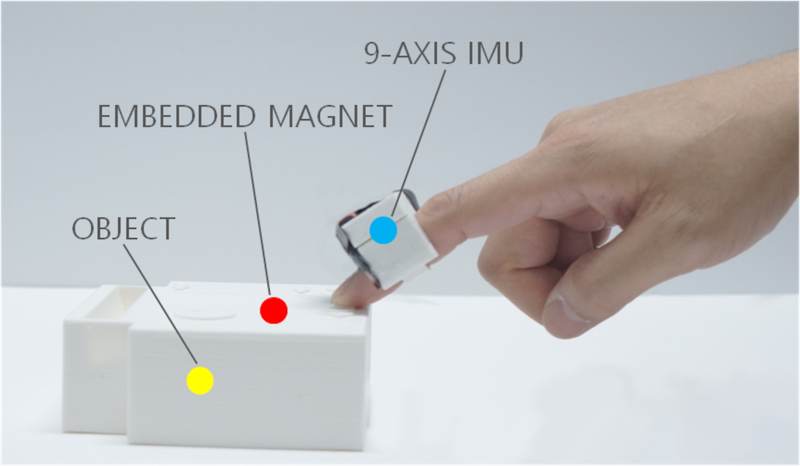 TRing offers a novel method for bringing inter activity to objects by embedding a small magnet in them and using a finger-worn device. No time-consuming post processing is needed. Using a magnetic-sensing technique, the system tracks the user's fingertip around the embedded magnet. Yoon, S.H., Zhang, Y., Huo, K., and Ramani, K. TRing: Instant and customizable interactions with objects using an embedded magnet and a finger-worn device. Proc. of the 29th Annual ACM Symposium on User Interface Software & Technology. 2016. By simply embedding a small magnet, everyday objects become interactive, without the need for installing electronic components.